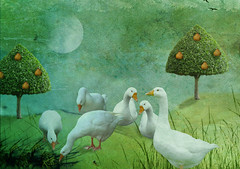 December 30th is here and so this is the “Sixth Day of Christmas.” The day of six geese-a-laying – and well symbolically things align as a flock of geese is a family. On the calendar of feasts days this is the Feast of the Holy Family – and really what is Christmas if not a celebration of family? Now I know some will react and say – but that leaves out so many people that have no family, or have broken families. And here I would remind you that all families are made, and re-made. A family is at first invented by two strangers who by chance and circumstance connect and bond and grow together. These two then draw in others by choice, creation and procreation. We all come from families and then move ahead and create our own families. And these created families then move ahead – they grow and divide and recreate into new circles of love and caring. When one stops and thinks of what the Church calls the Holy Family – it is not exactly a traditional family. Here we have a young woman pregnant before marriage, and hurriedly married to an older man willing to act as husband and step-father. In the cultural norms of their historical time period – that was shocking stuff. Yet by all the stories this newly created grouping thrived as a family unit – choosing to be together and struggle together through the unusual circumstances of their story. The truth about family is this: A family not something created by the bonds of blood and DNA . A family is created by love, respect and entirely by choice. Yes blood may be thicker than water – but blood is still mostly water. So how to celebrate today? By reaching out to your chosen family. Send an email. Make a call. Stop by and say hello. Take time to have a meal together – maybe some Middle Eastern cuisine like stuffed grape leaves, tabbouleh, hummus and flat bread, lentils and rice, or just whatever makes you feel comfort in each other. Share a cup of tea. Or a glass of wine. And just talk about what was and what is yet to come. Celebrate your successes, and build your dreams. That is what family is all about. Merry Sixth Day of Christmas to you and your family! The 6th day revisited. Go celebrate your family! I really appreciate this view of family. A very wise man, and my favorite teacher ever, once told my class that we have a family of chance and a family of choice. He was very aware of the DNA type of family issues, and knew that one of the best things we could do was make decisions about who we would let in our lives. It was also one of the healthiest things we could do. Yes that is how I see it – we are born into a family that initially cares for us. The nuclear family as we like to call it. And in our healthy growth we expand beyond that nuclear shell – creating new bonds and new relationships. That doesn’t mean the DNA family is abandoned – just that we need to choose how we keep them in our lives. And we need to also accept they have their own lives/loves to follow….